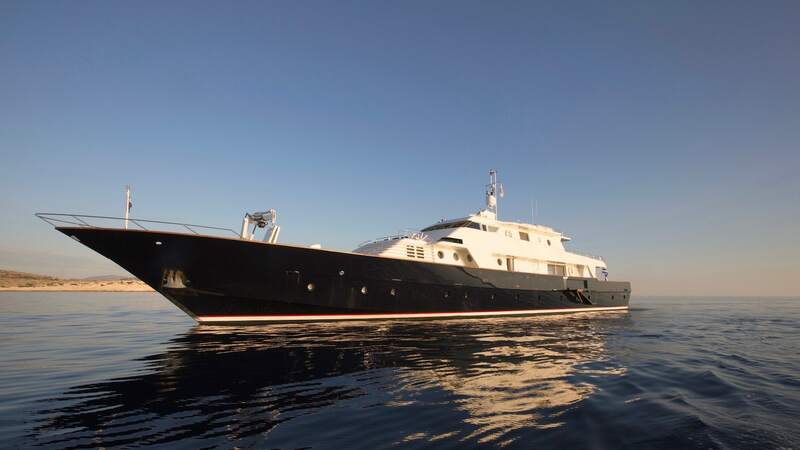 The beautiful 139’5″/42.50m Libra Y, designed by Jon Banenberg, is a classic gentleman’s yacht that stands out for her stylish interiors with original modernist furniture, her well curated collection of contemporary photography and her huge deck spaces. 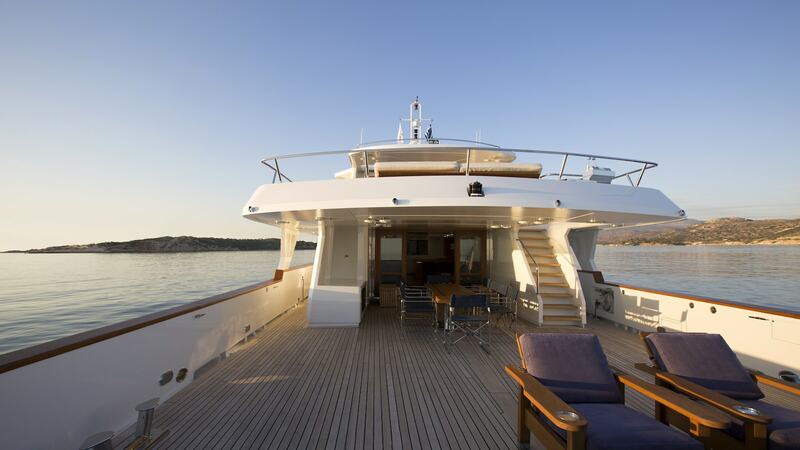 The yacht can comfortably accommodate ten guests in five cabins. Her perfectly balanced exterior lines blend beautifully with her extensive deck spaces, offering her guests a sublime on-board experience. More on How to Charter a Yacht here! Libra boasts a spacious main living room that can be transformed into an indoor dining area. Apart from her long sofas, she has stylish bean bags which are the ideal spot for lounging and watching movies. On the upper-deck guests can enjoy a rare combination of a private office and living room with original modernist furniture from the 50’s and 60’s. The vintage Charles Eames arm chair with foot rest and the Noguchi coffee table perfectly complement her teak-wood interiors and create a comfortable and highly distinguished atmosphere. 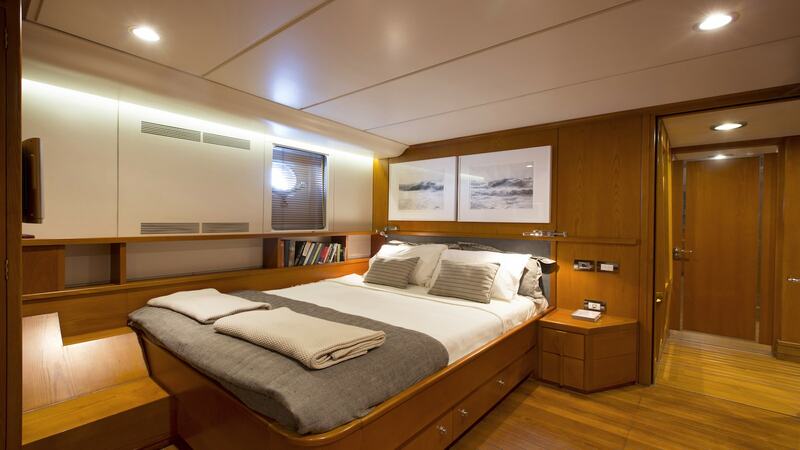 The yacht features a grandiose master cabin, two double-bed cabins, a twin bedded cabin plus a double bunk bed cabin. Being an art collector, the owner has curated a group of contemporary photographs throughout the yacht with the sea as the main concept. The collection includes works of art by Nan Goldin, Matthew Barney, Nobuyoshi Araki, Piotr Uklanski, Louise Lawler, Roni Horn, Roe Ethridge, Tacita Dean and Christopher Williams. Libra’s most distinctive feature is her huge aft-deck space, which is ideal for entertaining guests or simply enjoying the day and views of the Greek islands in absolute privacy and comfort. On the upper deck there is another large outdoor area, perfect for sunbathing and entertainment. In front of the bridge, a hanging balcony offers an extra sunbathing spot and the possibility to enjoy relaxing moments with just the sounds of the sea. Libra boasts a huge aft-deck space ideal for entertaining guests or simply enjoying the day in maximum privacy and comfort. Guests can enjoy a well-curated art collection of contemporary photographs throughout the yacht with the sea as the main concept. 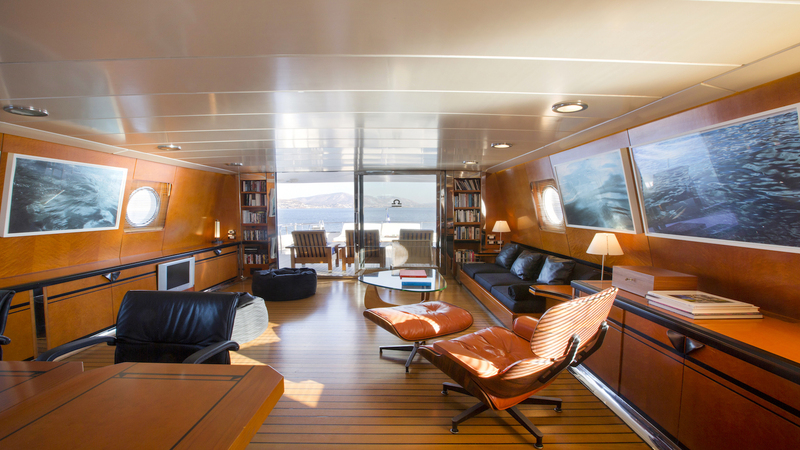 The yacht has beautiful stylish interiors featuring original modern design furniture that complement her teak-wood panels.